With its deck right on the Columbia River in Lyle, learn why the Columbia Gorge is such a rich area for growing a wide variety of grapes. Rob McCormick provides some insight into rainfall patterns and the dramatic climatic differences you'll find as you move east through the gorge. You'll get a firsthand view of the wild winds and dramatic setting of this vineyard, and learn about pioneering in a young AVA as you hear about their minimalist approach to winemaking where vintage and site are primary. Memaloose" wines are 100% estate grown, and are exclusively from the Columbia Gorge AVA. The Memaloose Label is printed from the Lewis & Clark diaries; they camped in this vicinity in 1806. Their other label is named "Idiot's Grace", and is the winemakers personal, small production label. In their first vintage, 2006, there were just 250 cases produced. The 2015 crop yielded around 3000 cases. Try Memaloose’s esteemed cab franc ($25 a bottle) made from Columbia Gorge AVA grapes. The Memaloose Wines tasting room is 15 minutes east of Hood River past fascinating geological features and expansive river views on the Lewis and Clark Highway. We would be delighted to welcome the group, and our facility is perfect for it. We can offer a 10% case discount, and our tasting fee is $5/person, applicable to the purchase of wine. I'd be happy to discuss the visit with you by phone at 360 635 2887. Details of arrival time, etc. will be important. Our location will be an unforgettable stop for your guests. ​- From the Tasting Room (A) go west 150 yards to Old Hiway 8, and turn right to head up the hill. - Go 1.1 mile on the Old Hiway, and turn right @ Canyon Rd. (You can also follow the signs to Domaine Pouillon most of the way to the Ranch). - Proceed 0.4 mile and turn left on to Lyle Snowden Rd. It is more of a fork than a sharp turn. 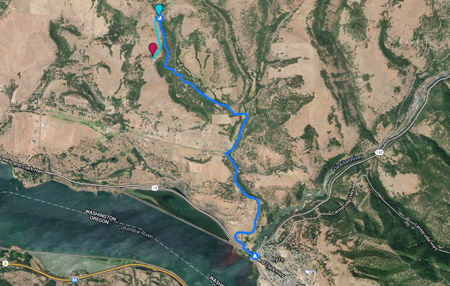 - Go 1.4 mile on Lyle Snowden. Turn left at our "Memaloose Winery" (B) sign on to a gravel road. Stay to the left at the rock formation and Mistral Ranch sign. - Go 1/2 mile to the winery. Park outside the fence in short grass.